If you move a package, ALL the child packages and their contents are moved to the new location also. Click on the element in the Project Browser. See Customer in the diagram below. Drag the element so that the cursor is over the target package icon. The element symbol (and, in some operating systems, the element name) displays at the moving cursor position. The element is moved into the target package. 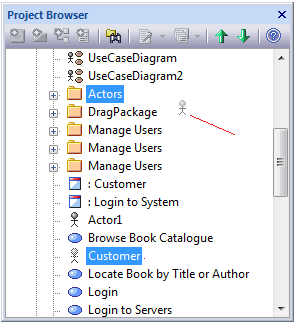 In the Project Browser, right-click on the element to be moved and select the Cut context menu option. The selected element is highlighted. Right-click on the package or element under which to move the cut element, and select the Paste context menu option. The cut element is listed as a child of the selected element or package, in the Project Browser.